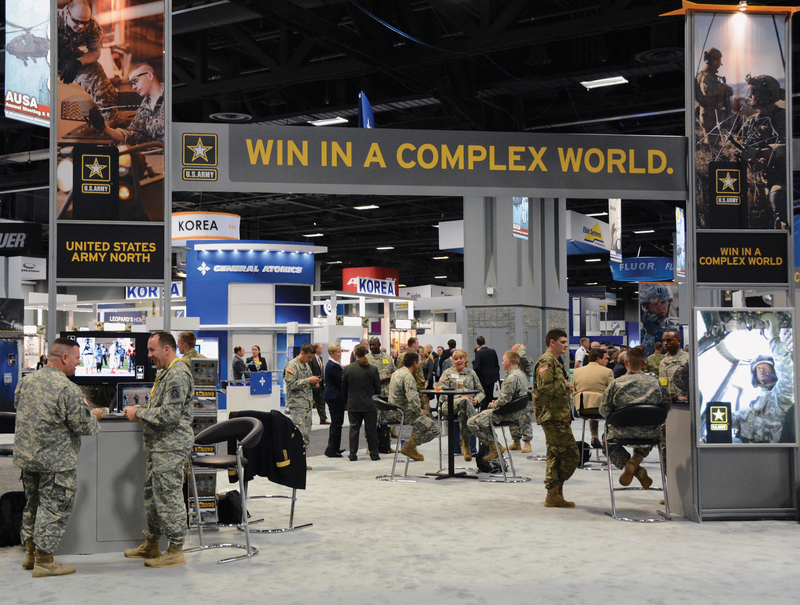 A little more than a year ago, the Army rolled out its new operating plan with the catchy name, “Win in a Complex World.” The plan spoke of developing a new breed of leaders, encouraging emerging technology and promoting innovative thinking in preparation for a future that Gen. David G. Perkins, the 15th commanding general of U.S. Army Training and Doctrine Command, said is not only unknown but unknowable. Today, “complex world” seems like an understatement. Festering threats such as Afghanistan, North Korea and Russia have coupled with multifaceted turmoil, including fighting in Syria. This change in the world catches the Army in a declining force structure, with troubling levels of readiness and too many idling weapons programs. Shortly before he stepped down, Army Secretary John M. McHugh described the Army as being at its “ragged edge” of preparedness, the result of its share of the annual defense budget dropping from $144 billion in 2010 to $126 billion in 2016. “We are in an extraordinarily rare position in American history where our budgets are coming down but our missions are going up,” said McHugh, recalling that when he became secretary in 2009, the budget was $235 billion annually and the Army had 553,000 active-duty soldiers. Today, the active Army has about 490,000 soldiers. Current plans call for the active force to drop to 475,000 by October; to 460,000 by October 2017; and to bottom out at 450,000 by October 2018. A smaller Army raises questions about whether the nation is taking on unacceptable risk, but Army Chief of Staff Gen. Mark A. Milley has been careful to not describe the force as being “hollow”—as the Army was labeled near the end of the Carter administration because of deteriorating readiness and personnel shortages. There is some line below which Milley worries the Army would be too small to carry out national security commitments, but he has not publicly shared his view. He has said only that he’s comfortable with an active-duty force of 450,000 soldiers as long as it is backed by a trained, equipped and ready Army National Guard and Army Reserve. Milley does not believe the smaller Army, which is also expected to shed about 17,000 from its civilian workforce over three years, is going to be permanently smaller. “There is no doubt in my mind that at some point, [the Army] will be required to expand again,” he said. At the top of the list is improving readiness. Only one-third of brigade combat teams are considered fully ready, but the sustained readiness rate should be about 70 percent, he said. Reaching that goal is expected to take at least two years. 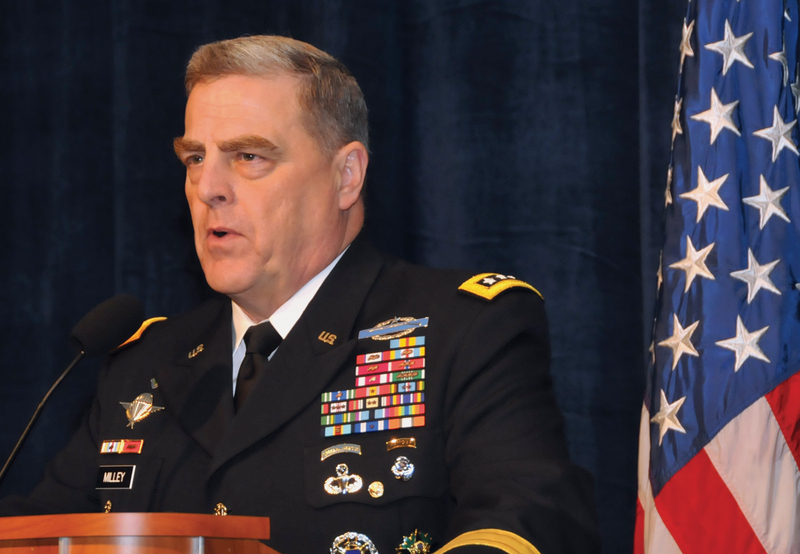 When Milley talks of uncertainty, he describes it as the increasing “velocity of instability,” requiring a force that is nimble and prepared for long fights in which advanced technology won’t necessarily give soldiers the upper hand. Wars might start with long-range standoff weapons, he said, but that doesn’t necessarily spell a quick end. “After the shock and awe comes the march and fight,” he said, referring to the phrase used for the March 22, 2003, massive assault on Baghdad that was supposed to quickly topple the regime of Iraqi President Saddam Hussein. While protecting the U.S. homeland takes what Army Lt. Gen. Perry L. Wiggins calls a “whole-of-government response,” much of the capability required comes from Army components. Wiggins, U.S. Army North commanding general, said working jointly with other military organizations and with state and local governments is different than being in combat because of the cooperation required. “We rehearse with partners. It is critical we exercise this zero-failure mission,” Wiggins said, noting most homeland security missions involve the military supporting another government agency that is leading the effort. “The Army does most of the heavy lifting on homeland defense,” said Robert G. Salesses, deputy assistant secretary of defense for homeland defense integration and defense support of civil authorities. Reserve contingent leaders stressed the special skills citizen-soldiers can bring to the homeland defense mission. Maj. Gen. James R. Joseph, adjutant general and commander of the Pennsylvania National Guard, said new cyber-protection units staffed by experienced, professional information technology specialists will serve each of the 10 Federal Emergency Management Agency districts. Maj. Gen. Daniel L. York, commander of the Army Reserve 76th Operational Response Command, said reserve emergency preparedness officers throughout the U.S. are prepared for short-notice call-ins in support of civil emergencies. More than 600 displays were featured in five halls on two levels. In today’s complex security environment, the Army does not have the luxury of a single opponent or threat and must be prepared to respond to all adversaries. “Unpredictable and unstable is the new normal,” said Lt. Gen. Mary A. Legere, deputy chief of staff, G-2. Both state and nonstate actors are taking advantage of instability, increasing populations, dwindling resources and technology proliferation to strike at the U.S. and the Army in a variety of locations around the world and at home, Legere said. Phillip A. Karber, president of the Potomac Foundation, said Russian aggression in Ukraine is not abating, and the Army needs to be prepared to face the Russian military’s new strategies. Known as “new-generation warfare,” Russian tactics range from information war and subversion to threats to overt military action, said Karber, who recently returned from a stint in Ukraine embedded with local military. “Unmanned aerial systems are ubiquitous in Russia’s war in Ukraine,” he said, adding that at least 16 types of Russian UAS have been documented in Ukrainian airspace. Additionally, the Russian military “favors mass fires over precision munitions … quantity over quality, which can cause catastrophic losses in minutes,” Karber said. Karber also said that Russian air defense systems covering nearly the entire country are crippling the Ukrainian air force, and the U.S. may not be able to rely on superior air power in such a situation. Brig. Gen. Karen H. Gibson, deputy commander, Joint Force Headquarters-Cyber, said U.S. reliance on cyberspace “has made the nation and our Army vulnerable. Those who seek to harm us in the cyber domain use the same Internet we do,” which means that adversaries once separated by oceans now have direct access to the U.S.
Gibson noted that cyber weapons are far less expensive and easy to find compared to conventional munitions. They are “a cheap and easy means to harm the American military,” she said. 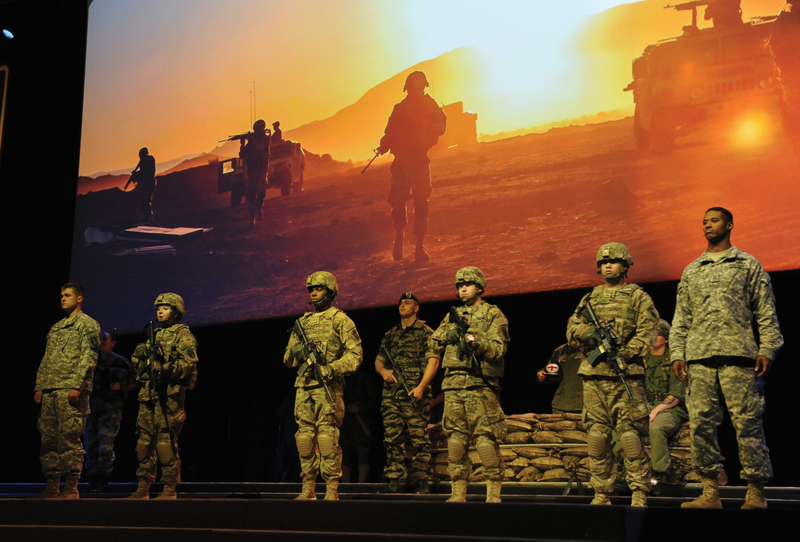 The Army needs to change its mindset about readiness, said Gen. Robert B. “Abe” Abrams, commanding general of U.S. Army Forces Command. “We have to be ready all the time, not at specific points of time,” he said, adding that the most precious resource for readiness is not money, but time. “Readiness for one mission doesn’t mean readiness for all missions,” she added. 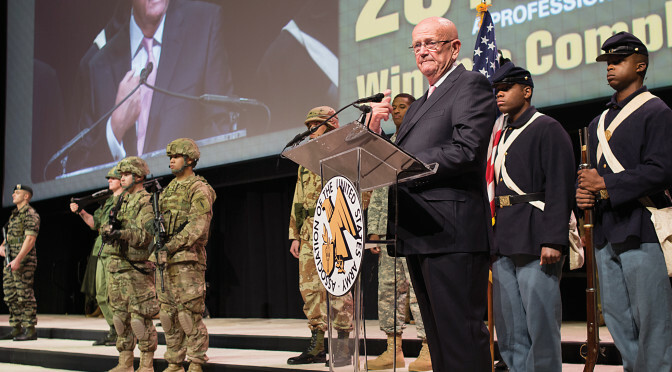 Retired Gen. Gordon R. Sullivan, president and CEO of the Association of the U.S. Army, opens the organization’s 2015 Annual Meeting and Exposition. 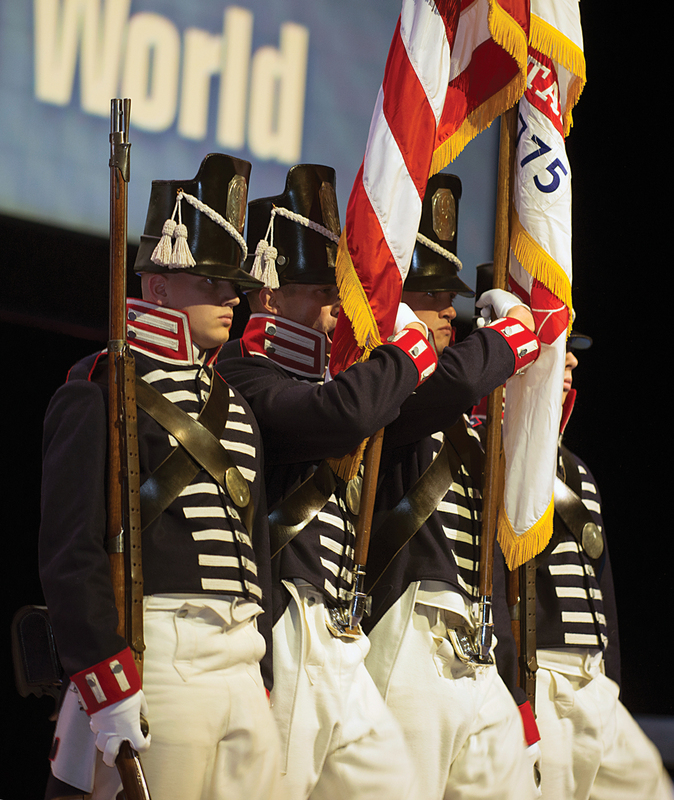 Scenes from the opening ceremony of the Association of the U.S. Army’s 2015 Annual Meeting and Exposition. At a time when international security is threatened not only by the Islamic State group and al-Qaida but also by North Korea and Russia, “the U.S. has planned only enough ground force to fight one major conflict in one of these places at any one time,” said Timothy M. Bonds, vice president of the Army research division at Rand Corp. In his division’s analysis of announced troop cuts, “this does not provide enough ground force capacity” to meet President Barack Obama’s commitments, he said. Soldiers and others mingle in U.S. Army North’s display. 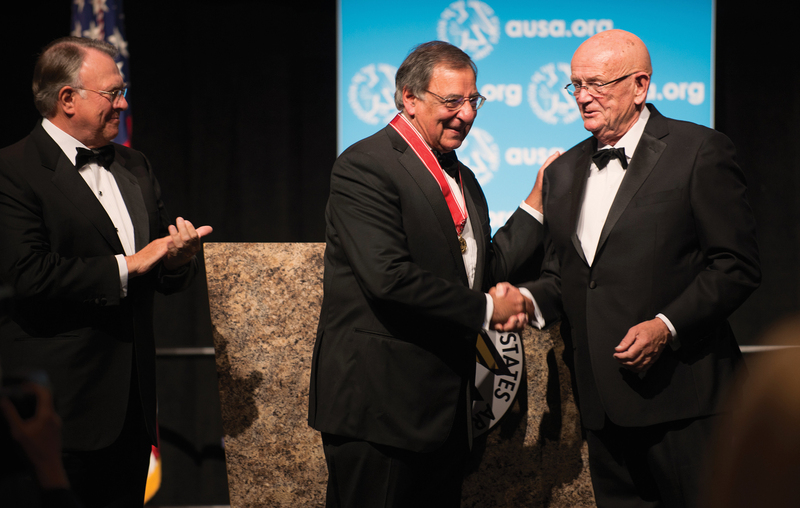 Former Secretary of Defense Leon Panetta shakes hands with retired Gen. Gordon R. Sullivan, president and CEO of the Association of the U.S. Army, after receiving AUSA’s George Catlett Marshall Medal. 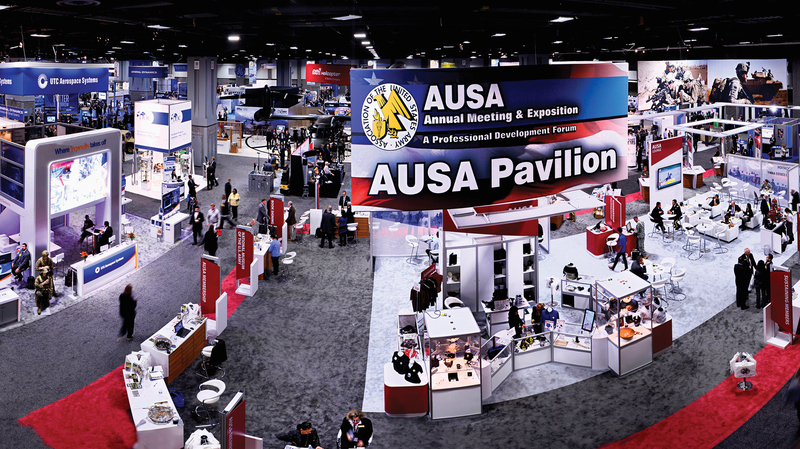 With representatives of more than 60 countries registered to attend AUSA’s annual meeting, Brooks emphasized the need for partnerships and the urgency to maintain already established ones. Lt. Gen. Ben Hodges, commanding general of U.S. Army Europe, and Maj. Gen. Darryl A. Williams, commanding general of U.S. Army Africa, reiterated the importance of alliances in their respective regions. With the support of 30,000 troops stationed in Europe, U.S. Army Europe faces resurging aggression from Russia. Meanwhile, U.S. Army Africa has dealt with Ebola research and medical aid efforts as well as joined in the fight against Boko Haram and an increasing presence of the Islamic State group in some of Africa’s 54 countries. Thomas Harvey III, principal deputy assistant secretary of defense for strategy, plans and capabilities, discussed refining U.S. approaches and applying lessons learned to find an approach that is efficient and economical, at a time when cost for modernization is increasing dramatically and the defense budget is tightening. With partners around the globe, the U.S. will have to be more selective, he said. Shaping tomorrow’s generation of soldiers to lead and fight in an ever-changing world full of unexpected threats is a top priority, senior Army leaders said. “There’s nothing more important than developing leaders for the future,” said Lt. Gen. Robert B. Brown, commanding general of the U.S. Army Combined Arms Center and Fort Leavenworth, Kan.
Gen. David G. Perkins, commanding general of U.S. Army Training and Doctrine Command, said in addition to understanding the tactical, operational and strategic levels of war, soldiers need to know how military and civilian components interact. “You have to have soldiers that understand all of those different elements. … We have to develop leaders that can harness all these elements of national power, and they can synchronize and deploy them in an environment that we can’t predict,” he said. Broadening assignments that take soldiers out of their traditional MOS provide new perspectives and can build a better understanding of the Army, said John E. Hall, president of Army Logistics University, adding that they’re beneficial for senior executive service civilians as well. “The Army recognizes that broadening never stops,” he said. “Development occurs over the course of a career,” said Command Sgt. Maj. David S. Davenport Sr. of Training and Doctrine Command. Training, education and experience are all interrelated, and they need to be aligned to make this paradigm work, he said. Leader development “builds trust in our units, prepares leaders for future uncertainty, and is critical to readiness and our Army’s success by exposing these great soldiers to these opportunities and teaching them how to think rather than what to think in a checklist mentality. That’s how we will build upon the leaders of today, so that future leaders will have the ability to thrive in ambiguity and chaos,” Davenport said.